Is your USB Pendrive infected by a virus and all the files and folders in your Pendrive are made hidden by the viruses? You cannot view them simply by enabling only the show hidden files and folders option because viruses converts them in to super hidden files. 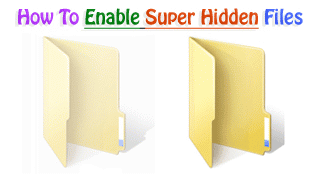 Enable the below option to view Super Hidden Files. Open My Computer. You can use Win+E shortcut to open My computer. UnTick Hide protected operating system files (Recommended). Press Apply button at bottom to save the settings. That’s it now you can view both Super Hidden and Hidden files on your computer. Now copy all the files in folders to new folders. Other wise those folders will remain as Super Hidden Folders. Follow same steps for windows xp, windows vista and windows 7 operating systems.